AxiTrader provides a quick and simple point of access to trade on a variety of markets. There are no deposit or withdrawal fees, and low spreads starting from 0.0, with very competitive margins on a range of products. You can download MetaTrader 4 to your computer or mobile device, or access your account using a web browser, with a range of quick deposit options and easy-access live feeds to make sure you never miss a deal. As with any online trading website, it’s important to remember that you can lose money whilst trading online. Easy-access live feeds to make sure you never miss a deal. 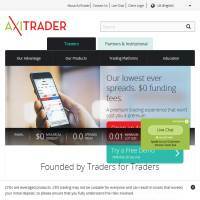 AxiTrader.com primarily focusses on Forex and CFD trading. You can therefore trade in currency pairs, using the latest live information to help inform your decisions. Alternatively, its CFD options include metals and oils, plus you can access indices trades. We’ll come back to those areas shortly, but first let’s see what the site has to offer in terms of tools and services. MetaTrader 4 is available to download, which is a popular platform with features for beginners and more advanced traders. The website also contains live information on market trends, so you can quickly check important market changes without having to log in. The team also provide live support via an on-site messenger, or you can send an email or call them if you need support. A few additional tools are available to help you analyse the markets and make predictions, although none of them are unique to AxiTrader.com. Top awards for quality customer support. This site has won numerous awards for its services, including prizes for the best spreads, best Forex broker (in Australia and Asia), as well as top awards for quality customer support. Expert Advisors are even on hand to provide professional recommendations, with fast execution on investments so you can identify and react to fluctuations quickly. 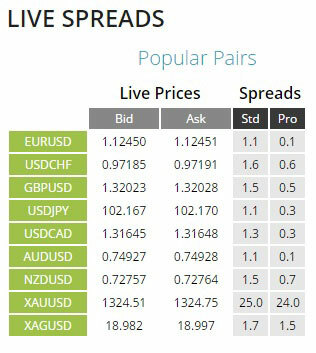 Easily view live spreads on popular currency pairs. Axi Trader claims to be “Australia’s most trusted Forex broker” and they’ve won awards for the most recommendations in Australia. You can check the site’s Forex for Beginners pages to learn about currency trading, or view a range of current tips from trading specialists. Additionally, the service offers low spreads, fast execution and flexible leverage to help put you in control of your currency investments. Trading leveraged products allows you to speculate on the price changes without owning any physical assets. Axi Trader offer a risk management tool to help you cut your losses and decrease your risk levels, whilst offering competitive leverage and spreads. CFD products include metals and oil. Gold, silver and oil are the commodities available with Axi Trader. You can jump right in, or open a free 30 day demo account with a virtual balance of $50,000 to get some practice. Margins are as low as 1%, with flexible leverage and no brokerage fees or commission. View the stock markets’ performance, selling short or long, with low margins, variable leverage and very tight spreads which allow you to benefit from small pricing changes. You can invest in key indices markets including Dow Jones and FTSE. A list of trading hours for each symbol is also available so you can trade around the clock. Jump into the markets within a matter of minutes. AxiTrader is a quick and simple system to trade with, allowing you to jump into the markets within a matter of minutes. Whilst it mainly focusses on Forex trading, you can also access a few other options, using a demo account to practice your techniques before investing with real money. The site’s won several awards for Forex trading and customer service, so if those are important to you then it’s definitely worth checking out, particularly since they don’t charge deposit or withdrawal fees, and there’s no minimum deposit amount, so anyone can start trading, regardless of their budget.